The ZooMed Repti Heat Cable is the ideal heat source for reptiles and amphibians, both inside and outside the terrarium. 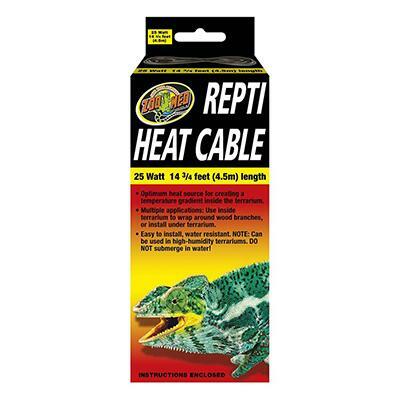 This 25 watt cable provides ample heat output. Excellent for wrapping around cage decorations and can be used in high-humidity environments. 14 ¾ feet long. Great source of heat to achieve temperature gradients inside enclosures. Heat cable can be wrapped around branches and vines, or arranged on the underside of the terrarium. Easy installation, water resistant, NOT water-proof. Great for heating multiple enclosures in breeding racks or similar configurations.